The new Alcatel A3 10 Android tablet has the same US$149 price tag of last year's model and features an IPS display, 4G LTE, a quad-core MediaTek processor, 3 GB RAM and 16 GB internal storage, as well as a 4,600 mAh battery. Sadly, this slate will ship with Android 7.0 Nougat onboard and there is little hope for an Oreo update. 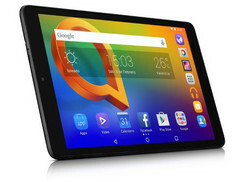 Although Alcatel released the A3 smartphone and a 6-inch Alcatel 3 XL phablet last year, the A3 name was also used for the 10-inch A3 tablet that was also launched back in 2017. Its specs include a MediaTek MT8735B processor, 2 GB RAM, 16 GB internal storage, and Android 7.0 Nougat. Sadly, the updated Alcatel A3 tablet that will launch in India on May 8 does not run Android 8.0 Oreo, but at least it comes with a few noticeable improvements under the hood. The updated Alcatel A3 comes with an unspecified MediaTek processor, most likely the same as last year's variant. However, there are 3 GB of memory now, although the amount of internal storage was not increased. The 10.1-inch IPS display with 1,280 x 800 pixels has not been upgraded, either. However, the 2 MP and 5 MP front and back cameras have been bumped to 5 MP and 8 MP. The battery remains at 4,600 mAh and promises up to 7 hours of use. Also known as the Alcatel A310, the new Alcatel A3 10 tablet can be acquired for the same price as its predecessor - roughly US$149. Since there are not that many changes between last year's model and the new one, you might find the review below useful since the user experience should be about the same for both — if we leave the photography-related tasks aside, of course.